Spring is on its way and I couldn't be happier! My lunch time walks in the park are now full of flowers and with the blue skies we've had recently, I think everyone has a little pep in their step. And if like me, you match your perfumes to the seasons, then you're going to want to take a look at the new fragrance from L'Occitane. Herbae (pronounced her-by) is for those of us who love green florals and I've been getting stuck into this bottle since the launch a couple of weeks ago. Inspired by the wild grasses that grow in the heart of Provence, if you closed your eyes and gave Herbae a sniff, you'd find it smells green. Does anyone else do that? Smell something and give it a colour? It's green, it's fresh and it's floral, it's bright, it's ladylike. Everything I look for in a perfume during the spring. I've packed away my stronger, more intense and deeper scents until the autumn and now I'm all about the florals. With top notes of Ambrette Seed, Vert de Bergamot Essence and Pink Peppercorn, a heart of White Nettle Flower Accord, Wild Rose Accord, Bramble Accord and Clary Sage Essence and base notes of Wild Grass, Captive Musk and Cashmeran, I don't know what the majority of those things are, but what I do know is that they all work beautifully together to create a symphony of spring, of growth, of the hope that summer is coming and that you're going to smell ridey while waiting for that to happen. I love how simple the bottle is and I'm delighted to announce that I haven't lost the lid yet. If I decide to carry my full bottle around with me, which I'm known to do, we'll see how long I can keep the lid for. But if the beautiful weather of the last few days have given you inspiration to try a new scent, please go and give this a try. It's spring time in a bottle and is out now online and in L'Occitane shops. And FYI, this would make an ideal gift for Mother's Day. The 50ml bottle is €65 and the 90ml is €89 and when I went to their website to check the prices, I saw they have a handbag sized version for €21! Totally getting that so I don't need to carry this around and won't lose the lid! I know we're only two months into the year, but I think 2019 is going to be the year of the foundation. I'm in the process of trying a few new ones out, but thought I'd start with the most expensive one as January is over and we're all rich right?! 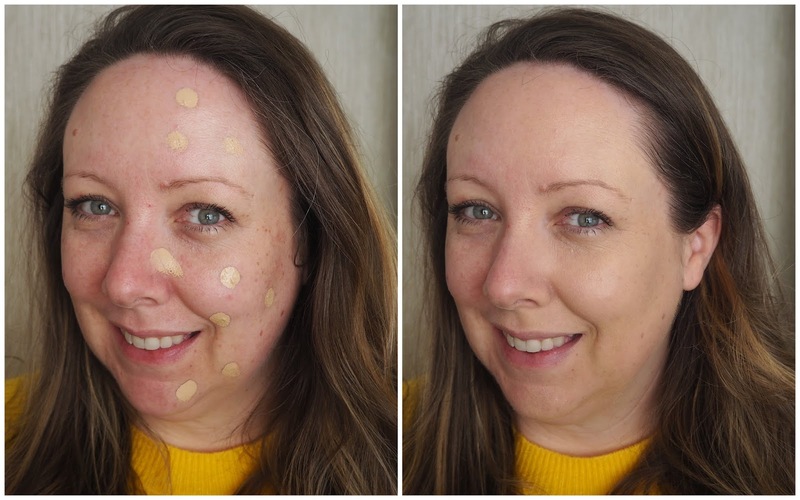 The Hourglass Vanish Seamless Finish Liquid Foundation is an eye watering €60, but with claims that it's suitable for all skin types and there's no need for a primer (amongst many other claims that I'll go through below), in the words of Carrie Bradshaw, I couldn't help but wonder how I'd get along with it. I've given the foundation a proper go over the last few weeks and out of all of the times I've used it, my skin was flawless and perfect for just one of those days. And even on that day, there was a bit of upkeep to it. As you'll see in the before and after photos below, I took two sets because I wasn't impressed with how it all went after the first day and felt bad! At the launch, we were advised to use half a pump of the product for our face, and that's exactly what I've been using. We were also advised to dot the foundation all over our faces and then buff it in with a brush. Doing that shows how truly opaque the foundation is and that half a pump gives a medium to full level of coverage with it, without looking too heavy or cakey. I've tried it with both a makeup sponge and a buffing brush and both give similar finishes. Because of the really thick consistency, dotting it over the skin definitely is the way to go because yes, I tried applying it directly from the back of my hand to my face one day in the interest of testing and applied way too much. I love the finish of it right after applying because it has that balance of coverage and glow, but it's a finish I have to powder down because I can feel the product on my face. It doesn't seem to dry down on me at all, so powdering has to happen. It definitely gives my skin a smoothing effect with a lovely radiance to it and each time I've used it, I'm generally impressed with it for the first hour or so. 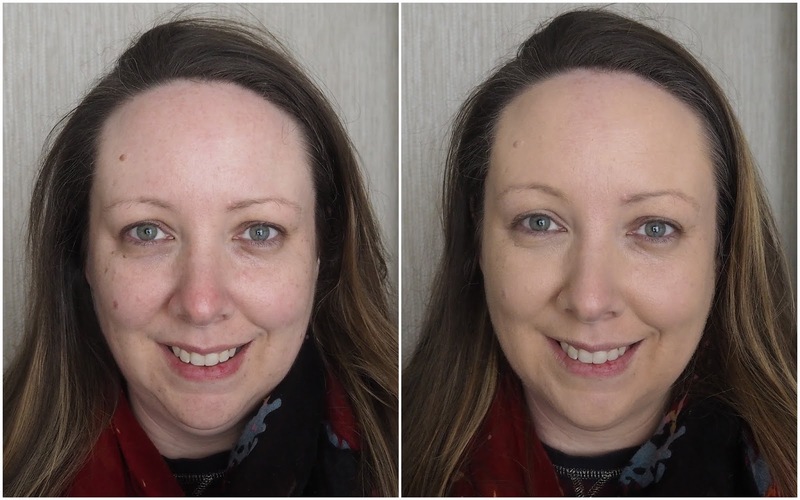 The very first day I tried it out, I powdered half of my face with my usual Charlotte Tilbury powder, so I could see how it lasted and how it sat on my skin. And as an oily skinned bridie, I was so aware of how shiny both sides of my face was for the whole day. I only powdered it that morning and left it for the day and spent the day asking the girls if I was offensively shiny because I felt like I was! The foundation fairs best on me when I powder it completely to set it, but even then I have to powder my whole face every couple of hours to keep it in place, adding extra powder on my nose. That seems to be my biggest problem area when using the foundation because it starts to break down there within the first hour. I've not been able to get it to look even on my nose at all, using a brush or a makeup sponge. Now, this foundation confuses me and my skin, because somehow, it manages to make me look oily and dry at the same time. On my cheeks, it's just beautiful and my blushes sit perfectly on top. But on my nose and on any dry patches, it clings to those areas, so if you're someone with dryer skin than me, I'm not sure if you'd like this. But it also makes my nose look oily. So I end up having to powder it to take care of the oil but then powdering exacerbates the look of the dry bits. I don't know at all at all! It's claimed to be transfer proof, but I haven't found that to be the case at all unfortunately. Because it makes my skin look and feel oilier than usual, if I touch my face at all, it just wipes away. I remember having a tiny itch on my forehead one day at work and barely used my nail to scratch it, checked my mush in the mirror and the foundation had completely disappeared in that area. Because it seems to make my skin look and feel oilier, I found that I can't wait to come home and take it off, so while I haven't tried the 24 hour fade proof claim, it looks pretty rough after 10 hours on me. I think for a foundation that's €60, as the song says, it's got to be perfect. And this just requires a lot of work for it to look good on me, so I haven't been reaching for it unfortunately. I think I'll give it a go with a mattifying primer and see how I get on before throwing in the towel completely. I love Hourglass and have tried a good few of their products over the years, but this isn't the one for me. On a positive note, it comes in 32 shades! I use the shade Shell but it's slightly too dark for me (story of my life), so if you decide you want to try it, get colour matched and then go outside into daylight so you can see it properly. It's such a shame this didn't work for me because I was so excited to give it a go. Ah well, you can't win 'em all Hourglass. Affordable makeup storage from Penneys! Those of you who follow me on Instagram will know that trying to keep my office tidy and organised is a full time job in itself. I'm naturally a messy person but I'm taking steps to change that because as they say, a tidy space is a tidy mind, or as I say, feck sake Karen why can't you keep your room tidy because you know you get loads more bits done when it's all nice and clean. I could keep giving out about it to myself, or I could take action, so last week I went to Penneys on Mary Street with a mission. An organisation station across the nation mission. I wanted to get some of their makeup storage bits so I could tackle the job at hand. The job being put some kind of shape on the state of my room. And on Saturday, I did exactly that. Here's what I bought and here's what I did with them. I bought this tiered unit (€12) before Christmas for Joanne and I'm raging I didn't get one for myself then because I love it! Not only does it fit a load of products on it, but it rotates too. I found with my skincare bits in my bedroom, having them on the top of a drawer unit meant that I'd just tend to reach for whatever was at the front and so many things were being forgotten about. Now all I have to do is rotate and select what I want, and I might be in with a chance of actually finishing more than one or two products now! I keep my eye creams in the top with some smaller facial oils and serums and then in the bottom two sections I just have them organised based on size. I have to keep the taller products to the outside of the shelves, but it's grand. I love this unit so much and I think it's my favourite of all the bits I got. I've wanted a nail polish stand for years now and was so close to buying one from eBay for stupid money that I could attach to the wall, but then I copped on and said no. Since then I've been keeping them in another storage unit that I rarely go near. Now while this unit is only small and I chose smaller bottles of polish to put on them so I could fit more on, if you're a polish collector, you might need a few to display your stash, but for me, it makes for a dinky unit to keep the new nail polishes I've been sent and want to try out. It's only €4 and well worth picking up. I love this palette storage unit (€6) and when I was chatting about it over the weekend, it occurred to me that it would make a deadly thing to store notebooks in, so I'm going to get another one next time I'm in Penneys. But for now, it's housing some of my favourite palettes and ones I want to use more too. My pal Carly showed hers in action over the weekend and she keeps hers in her drawers. Her makeup drawers! Onto the acrylic drawers. I got two of the three units available and at €12 each, I think they're great value. They feel sturdy and while I've only had them a few days, I can't report back on how they've lasted just yet, but I'll keep you in the loop over on Instagram. I got one unit with two wide, shallow drawers that's great for lying your palettes flat, or for lip products, basically anything that's not chunky, and one with a deeper drawer beside two more shallow drawers. The drawers don't open and close the smoothest and there can be a bit of squeaking involved, but I ain't mad at that! There's a third unit in this collection with two deeper drawers side by side and all three can be stacked on each other. And if you love your lipsticks and displaying them, there's a lipstick holder that has the same dimensions as these units, so makes for a lovely topping to your collection! I already have one from TK Maxx a couple of years back but if I didn't, I'd totally have bought this. I saw one of the girls online showing drawer organisers from Penneys too so I'm going to need to pick those up because I'm on a budget and need to organise the rest of my collection without breaking the bank! Are you in need of storage for your beauty bits? And are you proud that two days after organising these, they're still looking great... I know, we'll see how long it lasts! As I said, I got mine in Penneys Mary Street so I can't say which other branches have them too, but keep an eye out! YSL Rouge Volupte Shine Heart & Arrows Collectors Edition review, photos, swatches! Just in time for Valentine's Day, YSL have relaunched the Rouge Volupte Shines - one of my favourite lip products ever! I first fell in love with them back in 2013, and you can read about them in that blog post where I look a little bit tranquillised in my photos, but I can assure I was not. I was loving my lips and was obviously very relaxed about that fact. Anyway, YSL have brought back four iconic shades, all with a fancy new collectors edition outfit complete with hearts and arrows, so if you're feeling like you need to treat yourself this Valentine's Day, look no further. Now, if you're planning on wearing the face off a chungfella this Thursday, just know that these have lots of slip to them so while they're comfortable to wear and look gorgeous, they won't last long, but will leave your lips lightly stained FYI. The Rouge Volupte Shines are ideal for those who are fed up with the matte lip trend, for those who love a semi-sheer, glossy finish and for those who just want to be a bit fancy schmancy because let's be honest, it's YSL and their packaging is goals. Fancy goals. Fancy goals with love hearts and all. Lined up above, we have No 49 Rose Saint Germain on the left, No 15 Corail Spontini in the middle and on the right is No 12 Corail Dolman. All three are beautiful and the missing shade in the quad is No 45 Rouge Tuxedo, a bold pinky-red. It's probably for the best that this shade didn't find its way into my life because from the description, I'd probably be scared of it, but the other three shades are all right up my street. Let's see them in more detail. Above we have No 49 Rose Saint Germain, a beautiful wearable pink that screams "spring time is coming very soon because there's a grand stretch in the evenings and it's only the middle of February". It's a true rosey pink which makes it a winner in my book because shades like this suit my complexion, they don't wash me out and are always in the bottom of my handbag. Next up we have No 15 Corail Spontini, a paler, peachier coral that would suit those with lighter skin tones. Even though I love a peach on me, I think I prefer the other two shades as they brighten up my complexion more than this one and it washes me out a bit, but a bit of tan and I think I'd rock it! Finally we have my favourite shade of the three, No 12 Corail Dolman which is a bright coral pink that I just love so much and even though I think it's the same shade as this one from way back when in 2013 (which I probably still have as I love it so much), this is me in a lip product. It's bright, in your face but is still wearable too. It's summer in a lip product so I'll be rocking it loads this year. The Rouge Volupte Shine Collectors Editions are out this month and are €34 each. Which one is your favourite? 10 under €10 - Best in budget beauty! As you're probably well aware, January was a long month. It went on for 432 days in total and as the month grew to an end, funds were low. Ok funds were low from about December 29th, but we won't go there. Now I love a bit of luxury when it comes to my beauty products, but I love me some bargains too. And even better, I love when the bargains are deadly products too. So behold my 10 under €10! The products that won't break the bank, but actually do what they're supposed to do. I've filmed a video chatting about everything that I've added to the bottom of the post, so if you want to listen to me waffle, scroll down like a good child. This was one of the products in the Rituals Advent Calendar last year. (which I will definitely be buying again this year) and if you like your floral scents for spring/summer, you're going to love Oasis de Fleurs. It's bright and fresh and this mini size is €9.50 and the full size is €39. Rituals have a shop on Grafton Street and have the concession in Arnotts along with a shop in Blanchardstown Centre and Kildare Village, so you've lots of options! Ah the Waxperts Wonder Pads saved my poor scaldy face the other week when I could feel a massive pimple brewing underneath my skin. They contain salicylic acid which helps unclog the pores where the blemishes are and I kid you not, I sat with the pads on my skin for an hour or so while I was working and could feel a difference already and by the next morning, the pimple was gone, my skin was flat and all was well in the world again! As someone with greasy hair and who's trying to not wash her hair every day, dry shampoo is a must for me. I've tried different ones over the years and always go back to Batiste because it's affordable and it does the job. And as I mentioned in the video, one of my top tips that I didn't make up, just read it online somewhere, is to apply your dry shampoo before you go to bed and let the tossing and turning during the night work the product into your hair and you'll wake up fresh as a daisy the next morning! Well your hair will. I love the Blush version and also the Blonde one that helps hide my greys. I love a lip mask and I love even more when the lip mask is cheap! And when the mask is cheap and fabaliss, there's nothing more you can ask for. The Alex Steinherr X PS... Beauty Sleep Spa Overnight Lip Mask is one of the best lip products I've tried in years. It has a light pink tint to it, is thick without being gloopy and really does nourish and hydrate my lips. I can't see myself ever being without it to be honest and if they bring out more, I shall buy them and I shall love them. I love the powders from Note and always go between this one and the mineral powder which outside of the €10 mark. The Luminous Silk powder is so finely milled that I can't see it on the skin and can barely feel it, but what I love is how matte it keeps my skin but without looking cakey or dry. A light dusting is all I need when I've finished applying my makeup and I rarely have to touch it up throughout the day. Love it. Every time I'm in Spain, I have to hit up Kiko because the products are just incredible, and the Smart Colour Blushes are one of my favourite purchases from them so far. I bought two similar shades that are very different despite what your eyeballs might think and I just love them. The formula is silky, pigmented (a little goes a long way) and they're blushes I reach for over my more expensive ones time and time again. I reviewed these last year if you want to take a look, but I'm still loving the Colour Up Lip Crayons from Flormar. They're handy to have in the bottom of your handbag when you need a little something something on the lips that doesn't need much precision to apply. The darker ones would need a liner, but the lighter shades are great for applying before you head into wherever you're going and there isn't much maintenance needed. My pal Jen from TooDollyMakeup was raving about this sponge before Christmas and the hype is real lads! I've tried cheaper makeup sponges over the years and this is the best one. It's soft, it absorbs water when you dampen it and gives the most gorgeous flawless finish. I now have no desire to go buying Beauty Blenders anymore to be honest. This is just the business! I love these little bottles of polish and they're perfect for the likes of me who would never finish a bottle of polish. I must have thrown out so many bottles over the years that have gone gloopy from me not getting through them, but with these, I totally can. I was sent some last year and then when I was in France last summer, I bought that bright yellow shade as we were heading to a sunflower field! Two coats is all I need with these and I love how they don't take up much space too. Perfect for bringing away on holidays. Wet n Wild do some of the best budget highlighters out there and this cream highlight is just beautiful. It gives a soft sheen to the skin, so for those who aren't a fan of strong, in your face highlights, then you're going to love these. It blends into my skin easily without disturbing the foundation underneath and is buildable if you need something a bit stronger. It's gorgeous! If that wasn't enough, here's the accompanying video to go with this post with me having the ultimate chats about the products above!